Anne Hathaway as Fantine in Tom Hooper's Oscar-nominated film Les Miserables. Start with the source. The musical itself, though much beloved by aficionados of Glee and Smash, takes Victor Hugo’s outraged critique of post-revolutionary France and turns it into a parade. While purporting to address the depredations and degradations of poverty, Cameron Mackintosh’s production was staged so elaborately that it depended on $150 tickets to keep it running. Thus there was the awkward matter of cheering gaunt poor people on the barricades from plush seats in the orchestra. Happily even overpriced movies like this one cost only $10 or so to see, reducing the contradiction between medium and message. But director Tom Hooper (The King’s Speech) and his collaborators have replaced that one difficulty with a raft of their own: frying pan, meet fire. First, Hooper is too enamored of his genuine French scenery to shoot an opera––necessarily a stylized event––in an appropriately artificial fashion. (The Anna Karenina device of placing the movie within a stage set would have worked brilliantly here.) But he won’t shoot these realistic scenes in natural light, or anything resembling it, because he’s also too enamored of all the stars he’s cast. So instead we get blinding illuminations of the dying face of Fantine (Anne Hathaway), of the three days’ growth of beard chronically sported by Jean Valjean (Hugh Jackman) and of the moles which make stern Inspector Javert (Russell Crowe) look like an ogre instead of a complicated man too wrapped up in doing his duty as he sees it to recognize its impact on the world. Many reviewers have blamed Crowe for everything wrong with Les Miz, making particular fun of his 30 Odd Foot of Grunts-level singing. In fact his work is perfectly adequate, and it’s not his fault either that Javert’s songs are humdrum or that he’s required to perform them perched ludicrously atop a horse at the edge of a storm-tossed battlement, a setting that reveals nothing about this pivotal character except that he doesn’t know enough to come in out of the rain. By the time Valjean and Fantine cross paths she’s got time only for a dying wish: that this near-stranger protect her daughter from Fantine’s own fate. Another series of episodes: Valjean looks for Cosette, finds Cosette, springs Cosette from street thugs (played with excess relish by Sacha Baron Cohen and Helena Bonham Carter), rears Cosette and finally turns Cosette (by now a young woman) over to Marius, the Paris communard with whom she’s fallen in love. 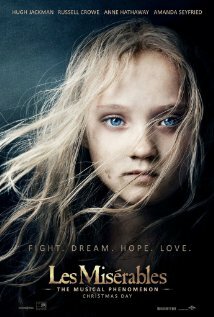 Somewhere in all this Valjean is also supposed to go beyond proper guardianship and fall in love with Cosette (Amanda Seyfried). Hugo’s work includes a strong whiff of forbidden love; Hooper’s does not, as Jackman never appears anything beyond avuncular. And without that element, the second half of Les Miz is nearly pointless. If Valjean never allows himself to be emotionally vulnerable, his life is no more interesting than a game of Pac-Man; we watch indifferently as he scuttles barely ahead of the open jaws of the law. I raced to this movie based on the moment in the previews when Anne Hathaway unfurls an amazing voice and the acting chops to match for “I Dreamed A Dream.” And that scene is truly wonderful; but it’s a long, hard slog from there to the end, with neither absorbing plot nor moving performance nor distinguished score to alleviate the monotony. So see that big scene here or when it appears (as it’s bound to) on Oscar night. Then gaze into the mirror like so many of the characters in the film, and warble yourself congratulations on the time and money you just saved.